A reorganized and comprehensive major revision of a classic book, this edition provides a bridge between introductory digital communications and more advanced treatment of information theory. Completely updated to cover the latest developments, it presents state-of-the-art error control techniques. 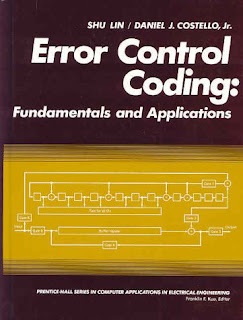 Coverage of the fundamentals of coding and the applications of codes to the design of real error control systems. Contains the most recent developments of coded modulation, trellises for codes, soft-decision decoding algorithms, turbo coding for reliable data transmission and other areas. There are two new chapters on Reed-Solomon codes & concatenated coding schemes. Also contains hundreds of new and revised examples; and more than 200 illustrations of code structures, encoding and decoding circuits and error performance of many important codes and error control coding systems. Appropriate for those with minimum mathematical background as a comprehensive reference for coding theory.